William Paden Mack was born in Hillsboro, Illinois on August 6, 1915, son of Commander A. R. Mack, USN, Retired, and Mrs. Josephine Paden Mack. He entered the U.S. Naval Academy on June 8, 1933, on Presidential appointment (at large), and while a Midshipman was a member of the Baseball, Basketball and Plebe Football teams. He was graduated with the degree of Bachelor of Science and commissioned Ensign in the U. S. Navy on June 3, 1937 and through subsequent advancement attained the rank of Vice Admiral, on January 28, 1969. On graduation from the Naval Academy in June 1937, he was assigned to the USS IDAHO (BB-42), and served as a junior officer in all departments of that battleship until December 1938. In December 1939 he joined the USS JOHN D. FORD (DD-228), and was serving as Gunnery Officer of that destroyer at the outbreak of World War II in December 1941. The JOHN D. FORD was awarded the Presidential Unit citation and the Army distinguished Unit Citation for service during the Java Campaign. From October 1942 until November 1943 he served as Aide and Flag Lieutenant to the Commander Amphibious Force, Pacific, attached to the USS PENNSYLVANIA, which won the Navy Unit Commendation for service in the Pacific Area from May 4, 1943 until February 10, 1945. He assisted in fitting out the USS PRESTON (DD-795), and served as her Executive Officer from her commissioning in March 1944 until October of that year with the latter months of that period participating in Pacific Operations. In October 1944 he assumed command of the USS WOODWORTH (DD-460), and remained in comand of that destroyer throughout the last months of hostilities and until April 1946. From May 1946 until June 1949 he served as Officer in Charge of the U.S. Naval School (Academy and College Preparatory) at Bainbridge, Maryland. He next commanded the USS RICHARD B. ANDERSON (DD-786) for eleven months, then had staff duty ,successively, as Assistant Chief of Staff for Operations to Commander Destroyer Flotilla One, and as Assistant Readiness Officer on the Staff of Commander Cruisers-Destroyers, Pacific. Detached from the latter assignment in May 1953, after participating in operations in Korean waters under the United nations command, he reported in June 1953 to the Navy Department, Washington, DC., where he served for two years as Commander Detail officer in the Bureau of Naval Personal. He was a student at the National War College, from July 1955 until June 1956, and in July became Commander Destroyer Division twenty-two. A year later he returned to the Bureau of Naval Personnel for duty, and on October 8, 1958, was transferred to the Office of the Chief of Naval Operations, to serve as Assistant Director, Special Projects, General Planning Group. On April 2, 1959 he was named Naval Aide to the Secretary of the Navy and served in that capacity until April 1961, when he became Commander Destroyer Squadron twenty-eight. In June 1962 he was assigned to the Office of the Special Assistant for Counterinsurgency, Joint Chiefs of Staff, Washington, DC., and on August 19, 1963 reported to the Office of Information, Navy Department, assuming the duties of Chief of Information on August 22. On may 15, 1966 he assumed command of Amphibious Group Two and from March 1967 until January 8, 1969 was promoted to Vice Admiral and Chief of Legislative Affairs, Navy Department. He next served as Deputy Assistant Secretary of Defense (Manpower and Reserve Affairs), Washington, DC. On April 10, 1971 Admiral Mack received the Distinguished Service Medal for his service as Deputy Assistant to Secretary of Defense, and on June 18, 1971 became Commander of the 120 ship SEVENTH Fleet during the time of the mining of Haiphong Harbor. He was ordered detached in February 1972 for duty as Superintendent of the U.S. Naval Academy, Annapolis, Maryland. On June 7, 1972 Vice Admiral Mack assumed the duties of the Superintendent of the Naval Academy in Annapolis at the time when all walls for entrance had to be broken down with respect to race and gender. When Admiral Mack took over the Academy he took a sentimental walk around the baseball field where he played in 1937. He said, "One year I hit .500-but I only got to bat six times." 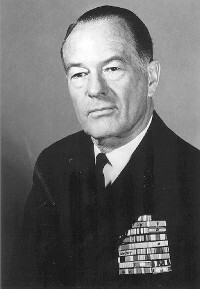 Since retirement from the Navy, Admiral Mack has authored several books including, "Naval Officer's Guide", "Naval Ceremonies, Customs and Traditions", "Normandy: A Novel", "South to Java", "Checkfire", "Command at Sea", "New Guinea: A Novel", "Pursuit of the Seawolf", and "Straits of Messina."